This includes some aspects of digital conservation, and the associated printed materials, as established as part of an earlier paper on music databases and metadata issues (also here in SelectedWorks). The present paper documents a small practical research exercise to collate experience on this subject. It was stimulated by an initial (incorrect) initial assumption that these techniques and precautions were very well known. Once checked with some libraries and music repository holders this proved to be substantially inaccurate. The consequence was to undertake a limited literature scan and interview process to collate some of the very practical experiences of those who do indeed do it regularly- and are all too all aware of the care and variation in treatment needed for different manufacturers and conditions of analog materials, tapes etc. As there is a fair amount of broader documentation on ‘what is desirable’ in the literature (Bradley, 2009), but the finer details of tape by tape variations etc are not... interviews with some people with exactly that level of detailed experience were needed. 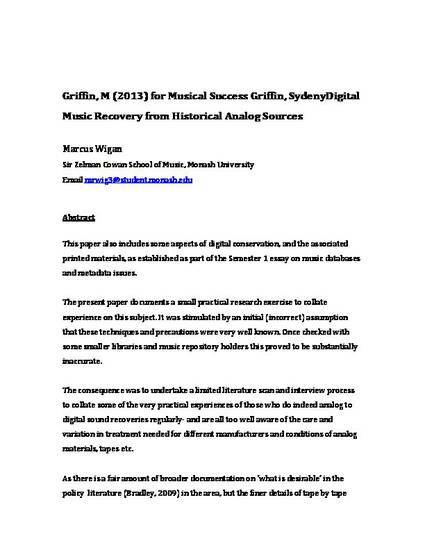 This is very pragmatic bit of research, and it is clear that that it will be worthwhile both for the author (who holds >100 tapes of 1970-80s MIFOH recordings in various levels of repair, mould growth, and manufacturers) and for the assistance of people in smaller music repositories who may not be fully aware of many of the practical details, and need to monitor their contractors. A common issue that arose was that the records (and thus the metadata) involved in not only the capture of the recordings, but also the processing and IP audit trails are now increasingly being seen to be necessary. Ethnomusicological conservation in other countries (India is given as a specific example) echoes the need for the highest quality (in terms of compression and sampling rates and depth) of sound recordings moved into digital formats. As the research proceeded it became clear that vinyl records needed to be covered as well. The paper concludes that full attention to redigitizing and remastering from original sources now offers a real opportunity to considerably improve on the ‘original quality ‘of many of the recordings, on both tape and vinyl, including those previously digitized, and that this should be examined further.